Game drive to the Ngorongoro Crater and its enduring charm stems from its overwhelming physical beauty and the abundance of wildlife permanently resident on the crater floor. Game drives in the Serengeti National Park, with many exotic species in sight including: Lions, elephants, zebras and more. Enjoy local meals at leisure, right beside the wilderness and its magnificant beauty. Please note the final 3 nights in Ndutu/Serengeti National Park lodges will change according to the time of year due to annual closures. Take a Uganda safari exploring the Queen Elizabeth National Park to discover the vast amount of wildlife residing in the area. Bwindi for your Gorilla Trek, take a boat ride in Lake Mburo. If its primates you want why not visit Rwanda for Golden Monkeys; Chimpanzees and Gorillas. On arrival at Kilimanjaro International Airport, you will be met and assisted by a local representative. 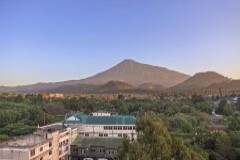 You will then be transferred to your hotel in Arusha arriving in time for check in. Rest of the day at leisure. After breakfast, your adventure begins. You will depart Arusha in 4x4 Custom made safari vehicle towards west of Arusha town and your intended destination is awe-inspiring Ngorongoro Crater. The scenic drive from Arusha, takes you through the rich agricultural land of Karatu area and past scenic escarpment on the edge of the Rift Valley with stunning views over the distant to Lake Manyara. The road seems to lead you to another beautiful forest but on arrival your breath will be taken away by the world's largest inactive, intact, and unfilled volcanic caldera – Ngorongoro Crater.From the rim of the crater, the floor looks quite distant but at the same time very inviting. You will proceed to your camp arriving in time for lunch. Take it easy after lunch to relax or alternatively you can take a nature walk or visit a Masai village. Nature walk takes you through ancient acacia forest with possibilities of learning about plants of medicinal value, birds and occasionally you will encounter other mammals grazing. The Masai villages are not too far away and here you get a chance to experience firsthand the Masai culture. Learn a thing or two about the set up of Masai ‘Manyatta’ or Masai homestead and even learn how to jump like a Masai. After early breakfast, it is your day to experience the Ngorongoro magic as you tour this awe-inspiring caldera. You will descend to the floor of the crater for a thrilling game experience. The central bowl, the caldera, has sides roughly 1,950 feet high and a flattish centre with a diameter of about ten miles. The views from the top of the crater wall are absolutely breathtaking. The crater walls are forested but four wheel drive vehicles will take you down into this primeval paradise of woodland, lake, river, swamp and plain that shelters around 20,000 animals. As you continue to enjoy the game experience, the magnificence of this great schism in the earth's crust will wow you. You will learn it is indeed an extinct volcano that collapsed in on itself around 25 million years ago thus forming a vast Superbowl where the largest permanent concentration of African game is on display. Many of these are the large grazing animals such as wildebeest, buffalo, gazelle and zebra that depend on the open grasslands in the crater. These attract the attendant predators, the black-maned lion, the leopard and hyena. The elephant found within the caldera tend to be the lone males who have left the herds in the forested crater rim. After the game experience, ascend to the rim of the crater, rest of the day is spent at leisure. thousands of eland, topi, kongoni, impala and Grant's gazelle. Golden-maned lion prides feast on the abundance of plain grazers. Solitary leopards haunt the acacia trees lining the Seronera River, while a high density of cheetahs prowl the southeastern plains. 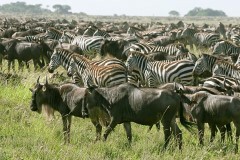 There is more to Serengeti than large mammals. There are over 500 species of birds, and your guide will also introduce you to the small five'. Stop enroute at Olduvai Gorge, site of archeological findings where traces of pre-historic man dating back to 3.5 million years ago have been discovered. Visit the on-site museum and witness a panoramic view of the historical excavation site. Full day spent in the Serengeti with picnic lunch. This evening you will enjoy a sundowner at the Mukoma Hills. Today after breakfast, check out and drive to Ndutu or Northern Serengeti with game drive enroute arriving in time for lunch followed by an afternoon game drive. Enjoy a full day safari with picnic lunch in the Kogatende Areas. After breakfast, check out and transferred to the local airstrip for your scheduled flight back to Arusha. 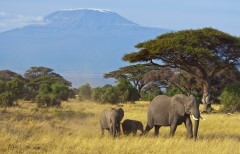 Upon arrival your will be met and transferred to Kilimanjaro Airport for your departure flight back home. Internal Airfares other than specified. Call us for prices on package using deluxe options Lemala Ndutu Tented Camp and Lemala Mara Camp. Please note deluxe camps have seasonal closer dates, see below for more details.